The school council meet once per fortnight, on a Thursday lunchtime, with Miss Mead. At The Glebe Primary School we have our very own School Council made up from one child in each class, Years 1 to 6, as well as our Head Boy and Girl. School councillors are chosen through a class ballot. Children meet at lunchtime where they all have the opportunity to provide suggestions for changes and improvements that could be made in school and the surrounding area. There are suggestion boxes in each class for children to write to their councillors and offer their ideas for how we can improve our school. After our meetings, the councillors are given time to report anything we have discussed to their class. In Autumn 2016, the school council entered a competition ran by Cleveland Police to help make Cleveland a safer place. The brief was to create a presentation to encourage young people to think about their behaviour in public places. The school council chose to produce a short multimedia message to raise awareness about the effects of criminal damage to the local community. The children wrote their own script, acted in a short film and even edited it to make the final version. It was filmed by a parent of a child in school. We are very proud and pleased to announce that The Glebe Primary came first in the multi-media Primary category. 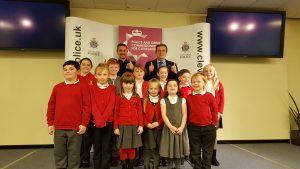 The children attended an awards evening at the Police Headquarters, and received a prize off Police and Crime Commissioner for Cleveland, Barry Coppinger. As a result, the film will now form part of a national campaign and will be shown to schools in the local area. A huge well done to all of the school councillors involved. Watch the winning film below! The School Council has been responsible for planning the improvement of the playtimes in both KS1 and KS2 and have chosen a range of products that have enhanced their enjoyment at playtimes and lunchtimes. Picnic tables so that children can eat their lunch outdoors, weather permitting! The school council has lots of ideas of ways to improve the school environment and school life. If you have any fund raising suggestions please contact the school office or come along to a ‘Friends of the Glebe’ meeting, every first Tuesday of each month.